November 27, 2018 – Framingham, MA – Star Realms United: Missions is coming to the Star Realms digital app! That means fans can now play Star Realms with secret alternate win conditions. The new app content makes Missions an option in head-to-head games, and also includes new campaign content. Players can get Missions for iOS, Android, and Steam. So all the stars are aligned for fans to download it today. Missions are a new card type that give players an alternate win condition. Each player receives three missions at the start of the game, which are hidden from their opponent. When a player fulfills the objective, they reveal the mission and score the reward. When they score their third and final mission, they win the game! Missions includes 12 unique cards: Ally, Armada, Colonize, Convert, Defend, Diversify, Dominate, Exterminate, Influence, Monopolize, Rule, and Unite. Star Realms United: Missions came out in physical form with the Star Realms United expansions. 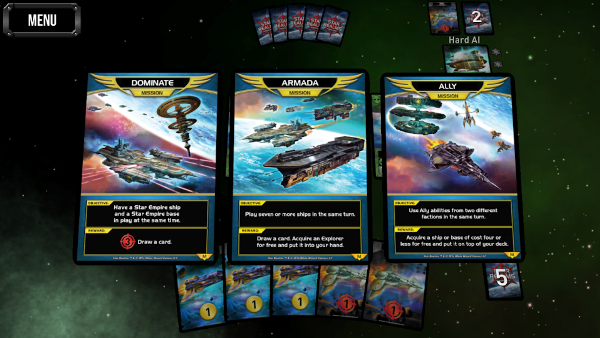 The Star Realms digital app is available on the App Store, Google Play, and Steam for $4.99. Players can always find an opponent, there are tons of opportunities to win prizes, and we put out new Arenas regularly (where we modify an existing rule or add a new one, and players keep playing until they’ve won 6 games or lost 2). For more information, visit the Star Realms blog, like our Facebook page, and follow Star Realms on Twitter @starrealms. White Wizard Games LLC, was founded in 2013 by a team of seasoned professional gamers dedicated to creating games that are affordable and fun for everyone. Their first game, Star Realms, a space combat deckbuilding game, exploded in popularity and has won 7 Game of the Year awards. Their games are known for being easy to learn while also having enough strategic depth for even the most advanced gamers. The founders include Magic Hall of Famers Darwin Kastle and Rob Dougherty along with veteran app designer Tan Thor Jen. New Star Realms Universal Storage Box – Fits Entire Star Realms Collection!